Ruth Davidson MSP is the leader of the Scottish Conservatives. Yes, that’s right: she’s a Tory. No, I have not gone insane. Ruth Davidson, over the past few months, has actually done a lot of inspirational things. And I have actually found myself admiring her story and her sheer bravery to tell it, especially in an extremely volatile political climate. Ruth Davidson first and foremost is a high-ranking politician. For someone to get that job, they often fall into the same category as everyone else who has had it before them. Usually, they’re all the same people from rich backgrounds, private schools, married with2.4 kids. But Davidson’s personal life does not fall into this category at all. What has really made Ruth Davidson an inspiration to me is her recent opening up about her mental health issues. She is always asked if she wants to be the British prime minister, and this time she gave a clear answer. Davidson said she would not run to be PM because she values her “mental health too much”. And she didn’t stop there. Davidson opened up about a history of depression and self-harm, something that very few people ever speak about in the media, least of all a high-flying politician. Davidson described her experience of depression as a “smothering black blanket over my head, cutting out the sky”. In the interview, the politician also told of a period of self-harm. Davidson admitted that she used to cut herself, rolling up her sleeves and revealing scars along her wrists and forearms. All of this gives those who suffer from mental health issues – or who have in the past – a lot of hope. 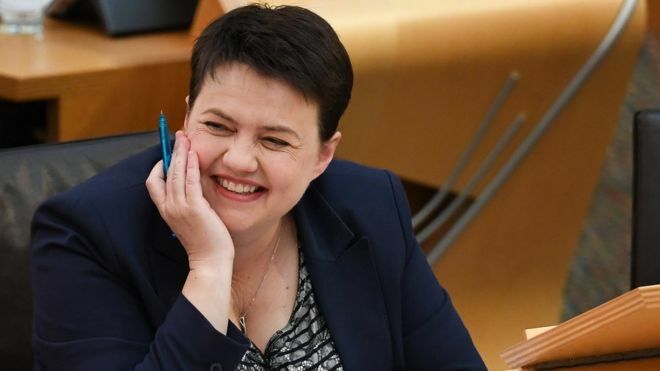 If Ruth Davidson, who has experienced depression and who has self-harm scars on her arm can make it to the top of the political ladder, then so can those like her aspiring to it. But the charm of Ms Davidson doesn’t stop there. She is also a shining light for the LGBTQ community as she is currently pregnant with her and her partner Jen Wilson’s first child, achieved through the IVF process. The news was announced back in April and came as one of those wonderful stories that are rare to find in politics. Although Ruth Davidson is just pregnant like a lot of women and just having a baby, it’s important. It shows a turning point in society and politics. When a leader – particularly a Tory leader – can do this and still keep one of the top jobs, it is a good sign. And it is undoubtedly inspirational. If I was a Tory, I’d be proud to have a politician like that in my party. And I’d be very sad she couldn’t be the PM. As it happens, I’m not a Tory, but I still feel proud, and grateful, that there’s someone like Ruth Davidson out there carrying the baton for mental health awareness and LGBTQ issues in a more personal way than anyone in politics right now. #YEAR12PROBLEMS So…Trump’s in. What now? Why exam factory schools don’t work Danny Dyer and Brexit: Finally Some Sense? Danny Dyer and Brexit: Finally Some Sense?